Exclusive NHS Discounts Bude. Find below offers and deals for NHS Staff in Bude. If you can't find what you are looking for, then simply refind your search with using the box above. Court Farm Holidays offer superb cottage and farmhouse holidays in Cornwall,located together in the idyllic Village of Marhamchurch, just 2 miles inland from the sand & surf of the North Cornwall coastline. Country pub just opposite. We offer group and private lessons in surfing and Stand Up Paddleboarding (SUP) everyday throughout the year on Summerleaze beach on the coast of North Cornwall. Glamping holidays offer: 15% outside of school holidays and public holidays in the yurts and cottages for ALL NHS staff. 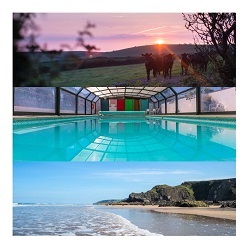 Glamping and cosy cottages near Bude on the North Cornwall coast. Close to beaches. Think campfires, quality time, wood fired ovens and a touch of the good life. Activities offer: 20% off of your first surfing lesson with us! We provide fun and safe surfing experiences for small groups, families and individuals. Only a surfer knows the feeling! Guesthouse offer: 15% discount on standard rates. Discount can not be combined with any other discounts or special rates. Woodview Campsite offer: Ring 01288331492 to get a discount,ask for Anne use the code word NHS.